Has the world opened its eyes to the Rohingya Refugee crisis settling in Bangladesh? 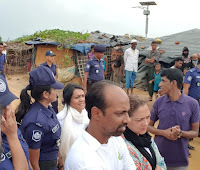 Recently, I visited Cox’s Bazar, Bangladesh to see first-hand the experience of the Rohingya refugee crisis as part of Project Shapla 2017, the Conservative Friends of Bangladesh social action project alongside a group of volunteers and three British MP’s. I saw alarming and distressing images, of the Rohingya survivors', both Muslim and Hindu’s with families of many young women and children. When you read on the recent atrocities, you cannot imagine the trauma, the horrific situation victims have faced until you experience the devastation and impact on their long journeys to settle in Bangladesh in one of the refugee camps. United Nations estimate the number of Rohingya's has topped over 500,000 since August 2017. According to one UN Chief’s, Myanmar treatment of Rohingya looks like 'textbook ethnic cleansing', a senior United Nations human rights official said. The river which separates Myanmar and Bangladesh is now a route for the Rohingya’s survival, and a gateway to life away from the Rakhine state as many Rohingya victims board small boats along the river. Some of the refugees also walk for days on foot to get to Bangladesh. 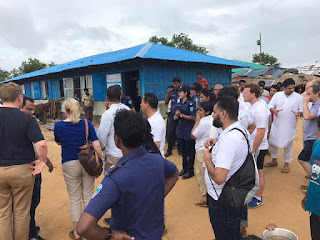 During the trip to Kutupalong refugee camp, volunteers heard from charities, informing us on the current, harrowing situation. UNICEF estimated 60% of the refugees are children, and many victims arrive with nothing but the clothing they wear. They suffer from starvation, and require basic health needs, nutrition and medical care. Bangladesh and aid agencies are providing shelter and basic facilities. 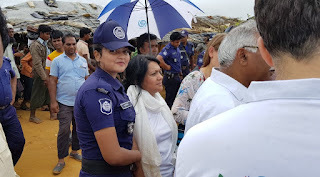 The Bangladeshi media have extensively covered the heroic intentions, pledges and support provided by the Bangladeshi Government to the current Rohingya crisis and the Prime Minister Sheikh Hasina in particular. The condemnation to the attacks taking place in Myanmar, and the plea for safe zones to be set up for the return of Rohingya’s back to Burma safely. Bangladesh announced it will work with the UN to build 14,000 new shelters, each housing six families. The International Organisation for Migration (IOM) estimated about 313,000 Rohingya had crossed into Bangladesh. Many new arrivals were on the move inside Bangladesh and could not be accounted for. 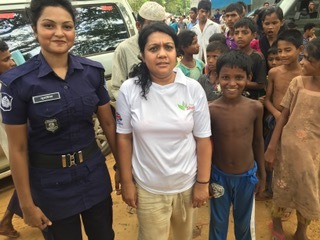 I wanted to learn more on: the work of counter-trafficking and protection of vulnerable migrants, the work carried out to support women and young children, the undocumented Myanmar nationals living in Cox’s Bazar, Bangladesh and the developments to ensure provision of safe spaces for women and children, with disappointment I returned. 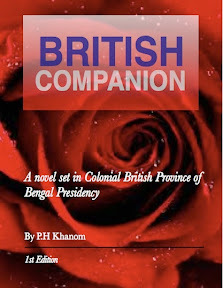 I now learn there are services provided, I did not have the opportunity to hear of these shared stories and actions. 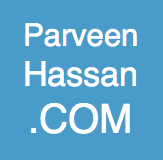 Recently, the UN deputy spokesman Farhan Haq, said that the total number of Rohingya refugees in Bangladesh was believed to be well over 700,000 people. President Hamid has also made a plea on global support for repatriating Rohingya refugees. I hope the global responses to the humane injustices are persistently raised by the NGO’s, charities and the people of Bangladesh for the Rohingya survivors. If you wish to donate, please visit the UNHCR, the UN Refugee Agency main website and its aims, "is the global organisation dedicated to saving lives, protecting rights and building a better future for refugees, forcibly displaced communities and stateless people," full details noted below.